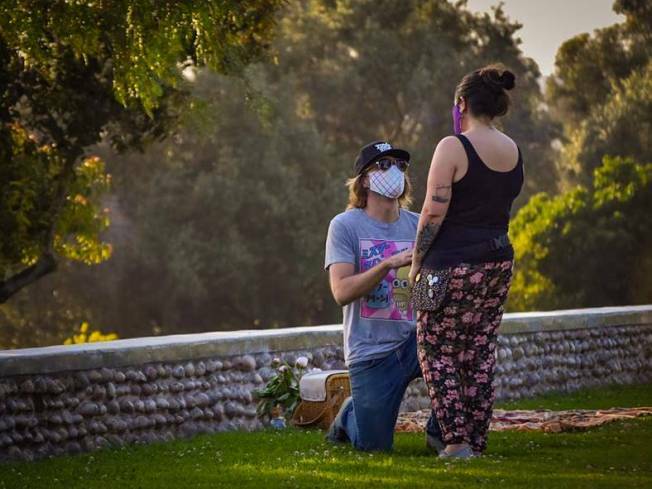 The iPhone4, Qik, Twitter and Foursquare helped pull off a very special proposal. Matt Van Horn plugged into the old-fashioned use of a ruse to surprise his girlfriend, Lauren, with an engagement ring this weekend. A Bay Area man just might have found a unique mix of new technology and old friends to pull off a one-of-a-kind marriage proposal. He also plugged into to the latest new media so his folks and Lauren's could all watch the big moment live online. Here's how Van Horn explains his self-described geekiness. Once I got the signal that she was there, I checked into Bernal Heights Park via Foursquare which shouted the URL to the live stream on Qik, which automatically synced to my Twitter and Facebook accounts. I knew Lauren received my tweets via text message on her phone, so I asked her to turn around as I proposed! He sent out a Foursquare location of the couple's favorite Bernal Heights perch overlooking the San Francisco Bay. He also sent a tweet with a livestream as soon as he learned his love had arrived. His friend recorded everything from the final nervous moments, to the getting on one knee, to the ultimate "Yes I will marry you." Classic. Lauren thought she was going to Bernal Heights so a friend could meet a potential dog she wanted to adopt. She thought Matt was in New Orleans. Matt said they haven't set a wedding date yet. We'll be waiting for that Tweet any moment. This weekend, Matt was a regular guy popping the question, but in his day job he's the head of business development for Digg and very well known in geeky tech circles.